Rain, rain go away. Come again some other day. Relentless rain. It seems like it will never stop. Until dusk, when the clouds clear for a bit. Despite the hour, I pull on my boots and go for a hike on the prairie. I wade through puddles on the path. Breath in. The prairie smells like it’s been rinsed in mint. Willoway Brook runs full and fast; the sound of water threads the evening air. 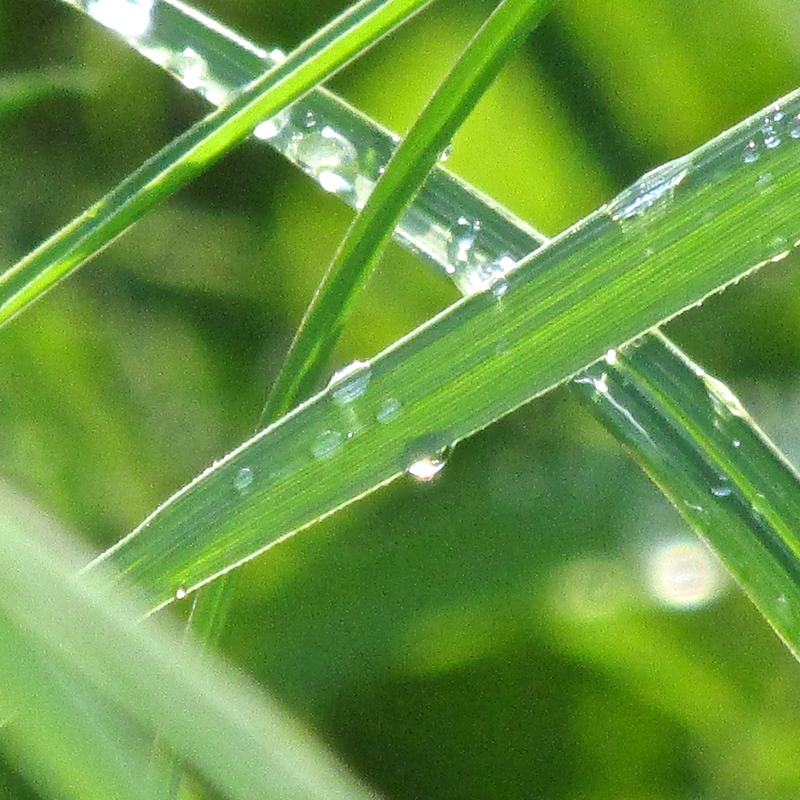 Grasses string necklaces of water droplets. 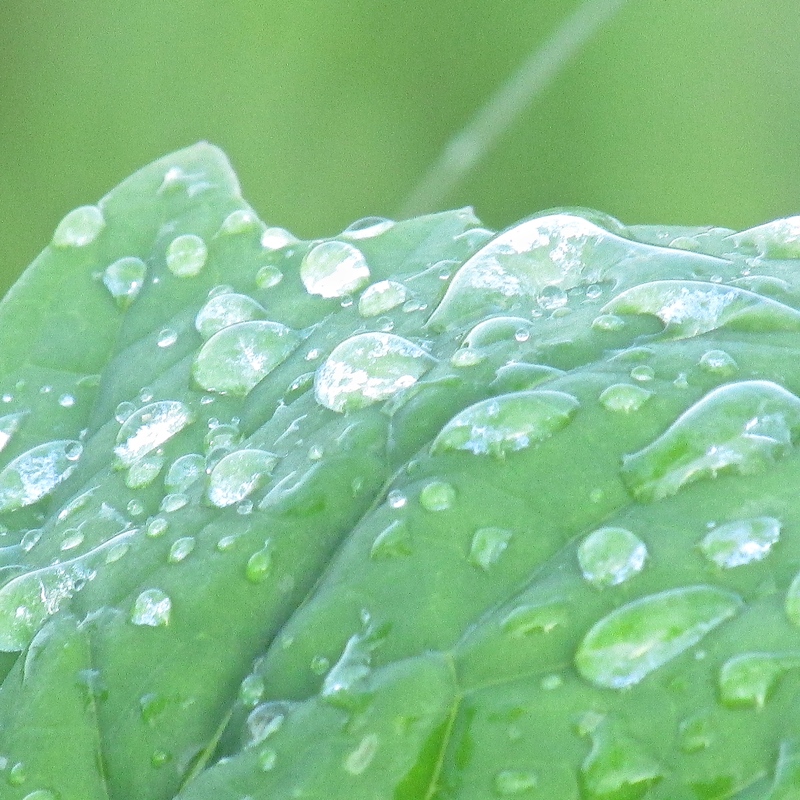 The rain pools in beads on the waxy surface of pale prairie plantain leaves. Clouds of mosquitoes whine, whine, whine around my face. I pull on my headnet. A deer, drinking from the overflowing stream, startles at my approach. 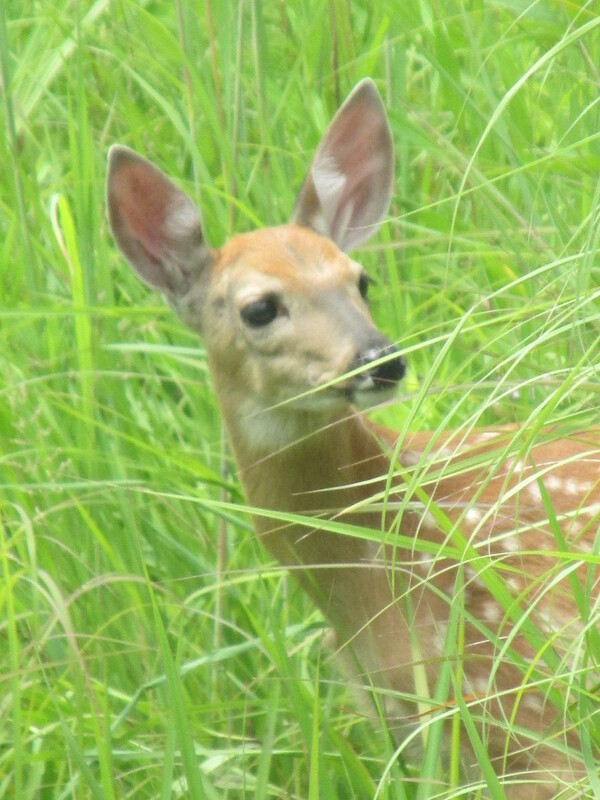 She crashes off through the oak savanna. 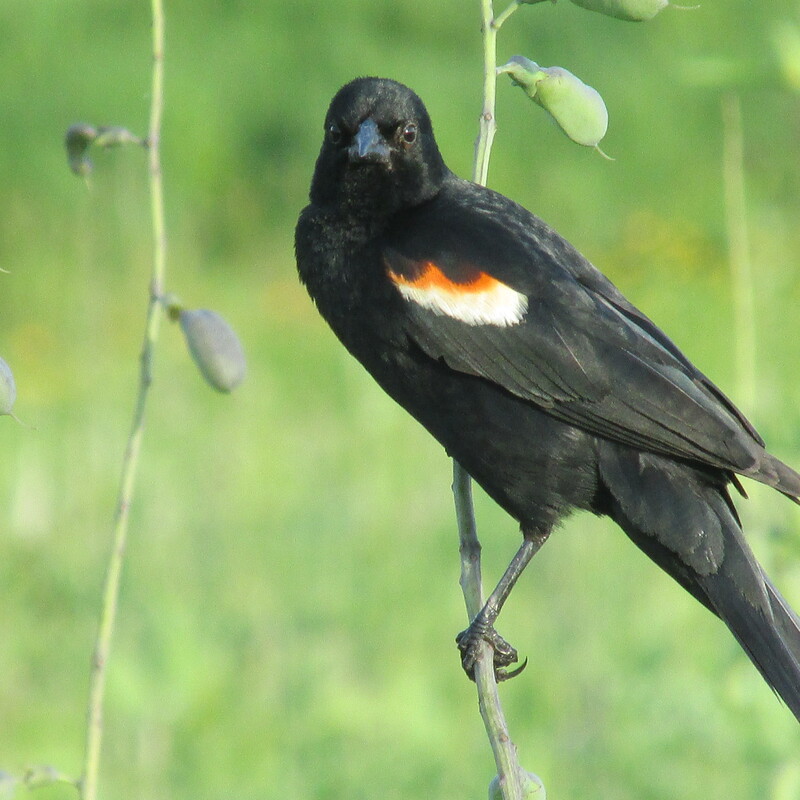 A red-winged blackbird bounces on a white wild indigo stem, heavy with seedpods. He shrieks a warning: Keep your distance! 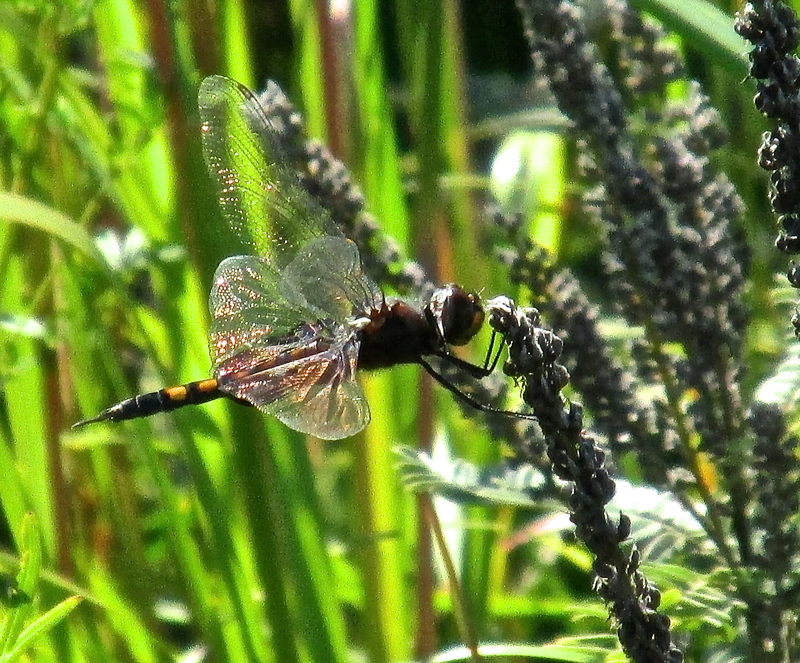 No doubt a nest is hidden along the stream. Water swirls, trapped in the base of cup plant leaves. Goldfinches sip the rainwater before they retire for the night. 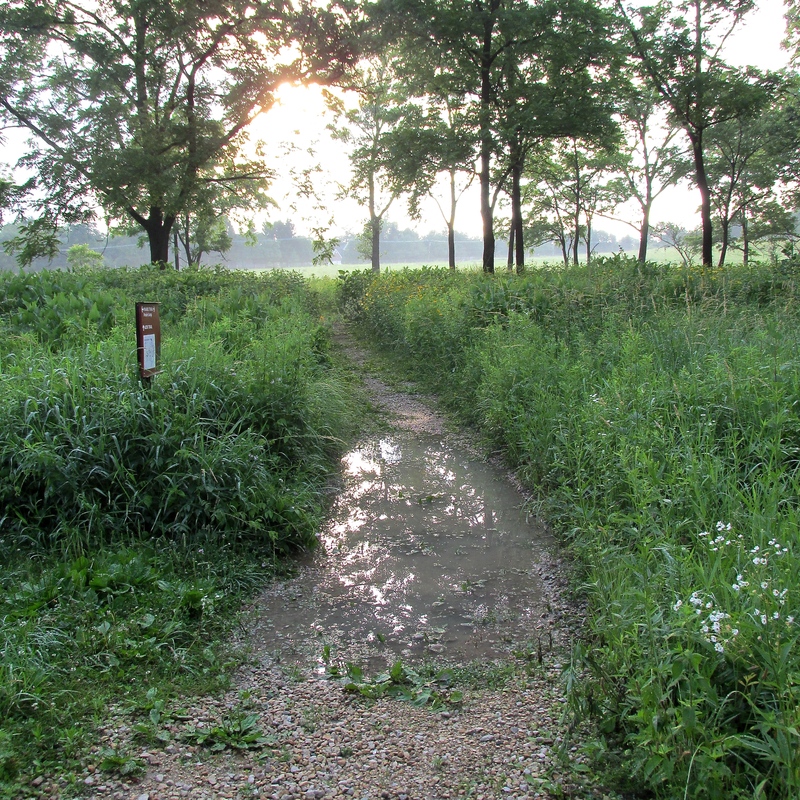 Culver’s root lifts its candles out of the tallgrass; wet and dripping. The moon rises, just a sliver shy of full in the East, as the saturated tallgrass turns its flower faces to the last light. The prairie sky hangs its clouds out to dry for the night. All photos by Cindy Crosby of the Schulenberg Prairie, The Morton Arboretum, Lisle, IL (top to bottom): Prairie trail; water droplets on grasses; water beading on pale Indian plantain (Arnoglossum atriplicifolium); white-tailed deer; red-winged blackbird; cup plant (Silphium perfoliatum); Culver’s root (Veronicastrum virginicum); prairie coreopsis (Coreopsis palmata); prairie at dusk. It’s this perennial’s pretty lavender blooms, shading to pink or white, that add a little pastel color to prairies in Illinois, July through September. 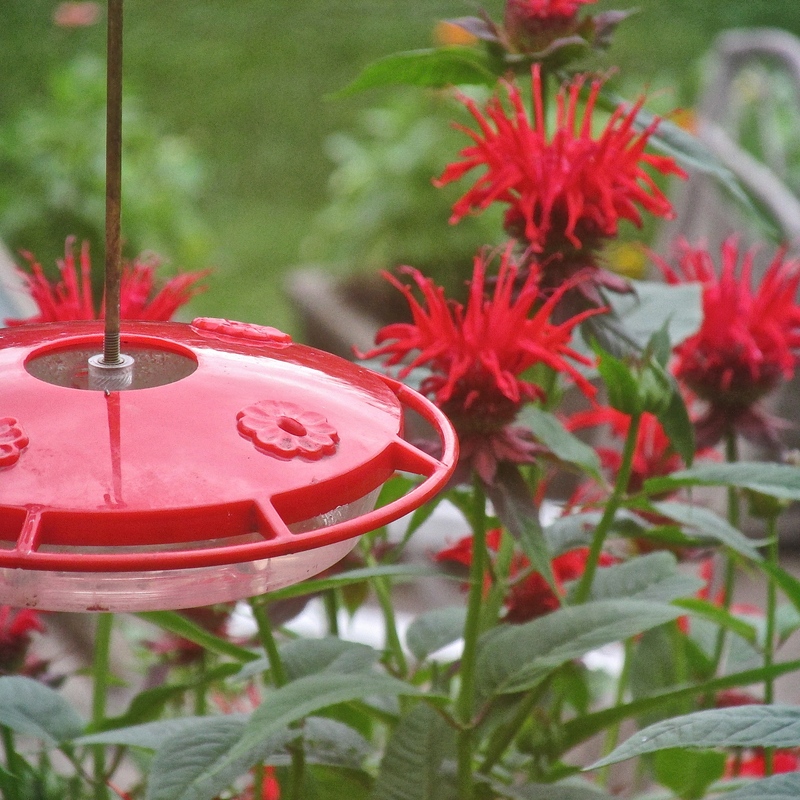 Butterflies, hummingbirds, sphinx moths and —- you guessed it — bees —find bee balm irresistible. And oh! The delicious smell of the leaves. Crush one between your fingertips and mmmmmmmm. Minty? Maybe oregano-ish? Or thyme? 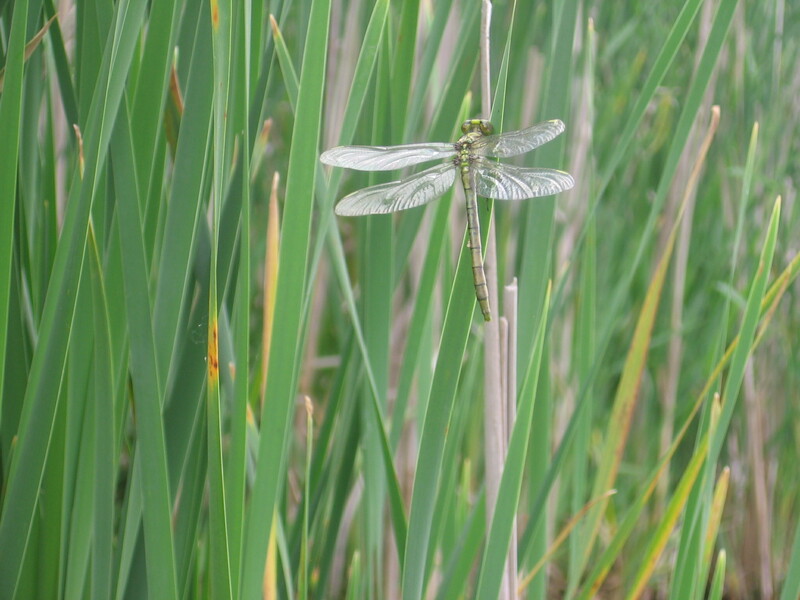 I’ve heard all of these scents from sniffing prairie visitors and natural history students. 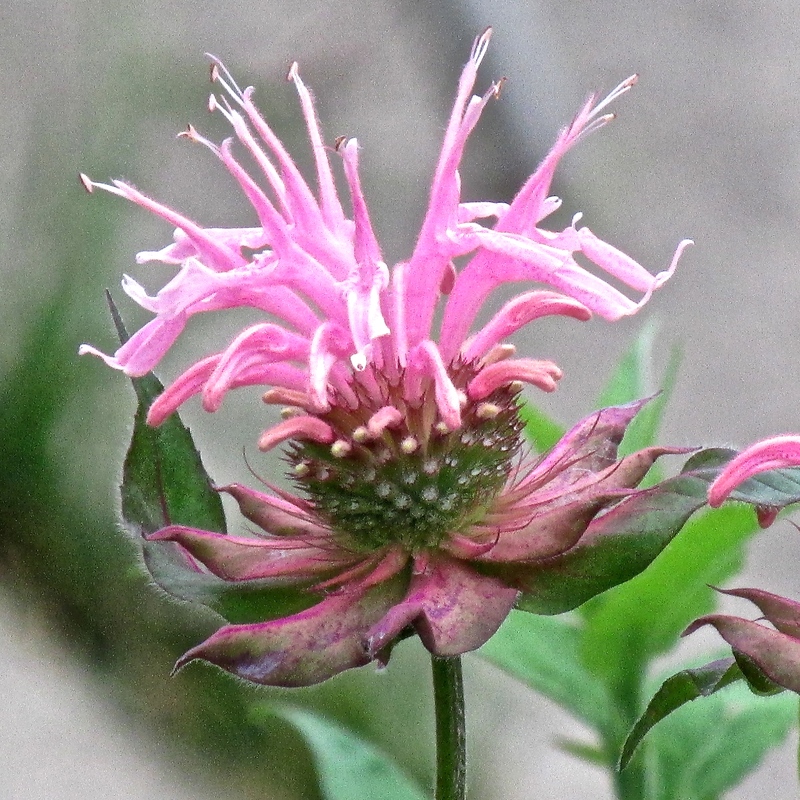 Bee balm is in the mint family (Lamiaceae) and has the square stem to prove it. 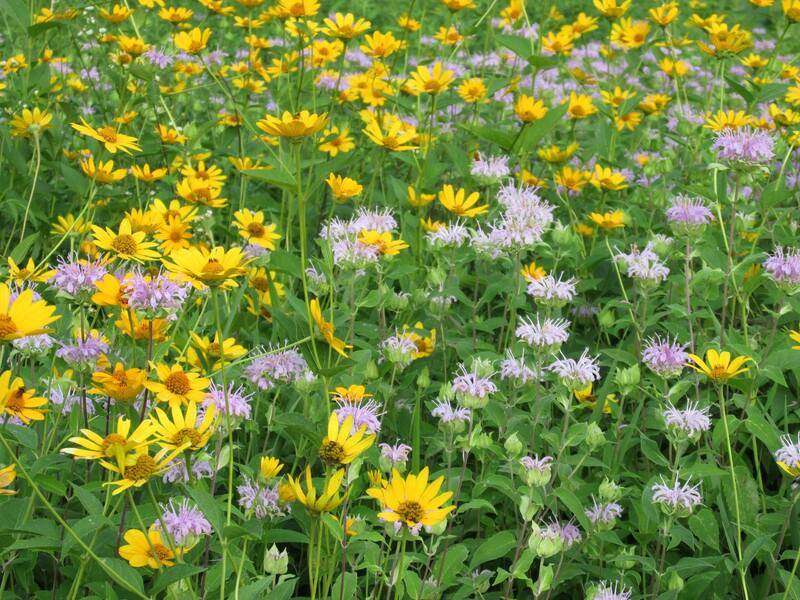 Many people think the smell of wild bergamot is the smell of the tallgrass prairie. I do. 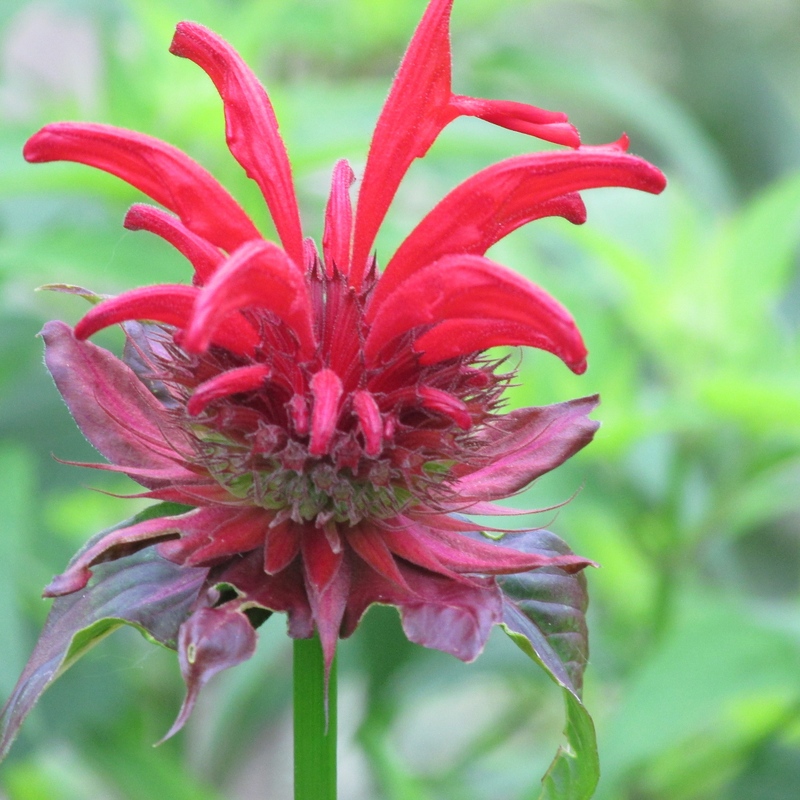 Tear off a leaf of wild bergamot — Monarda fistulosa — and chew it. Feel your mouth tingle? 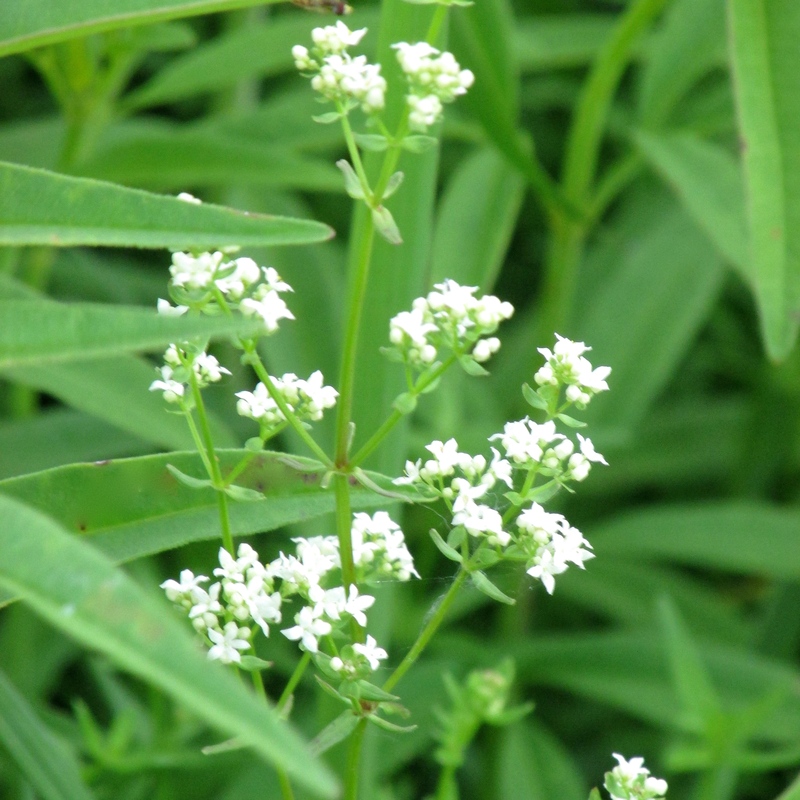 It’s considered astringent, and the taste can be very strong. 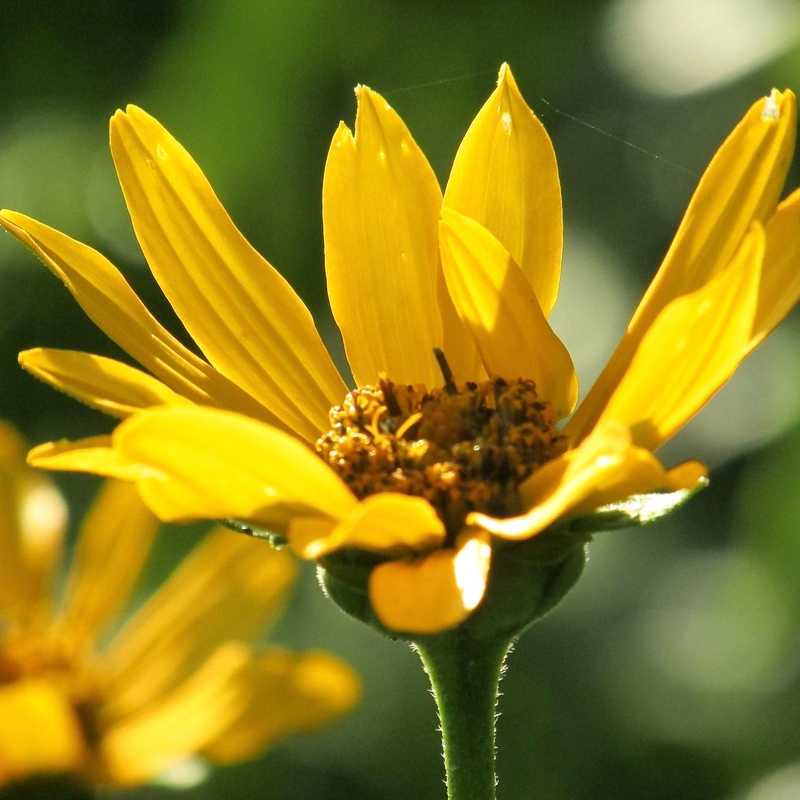 Native Americans liked to brew a tea or make infusions from the leafy foliage and flower heads as a cure for everything from a fever to a headache. 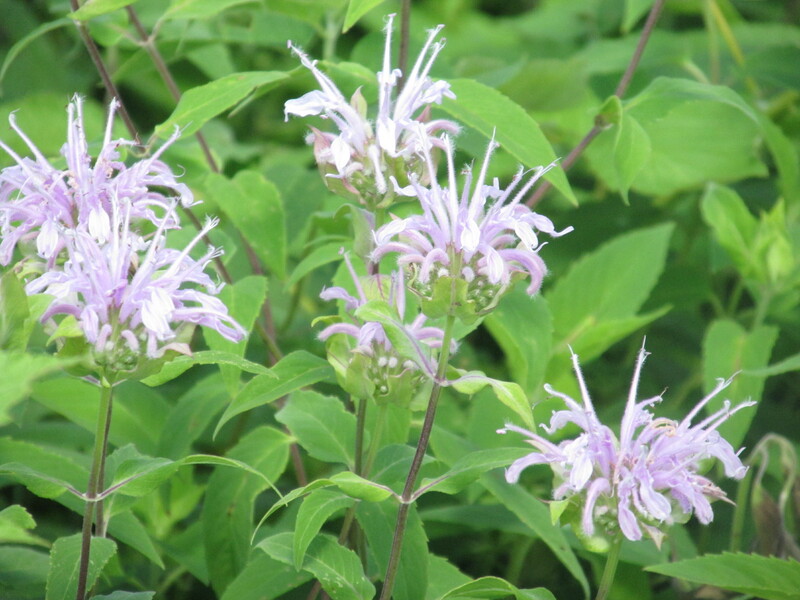 Today, you’ll still find people drinking wild bergamot tea as an herbal remedy. I find it refreshing. 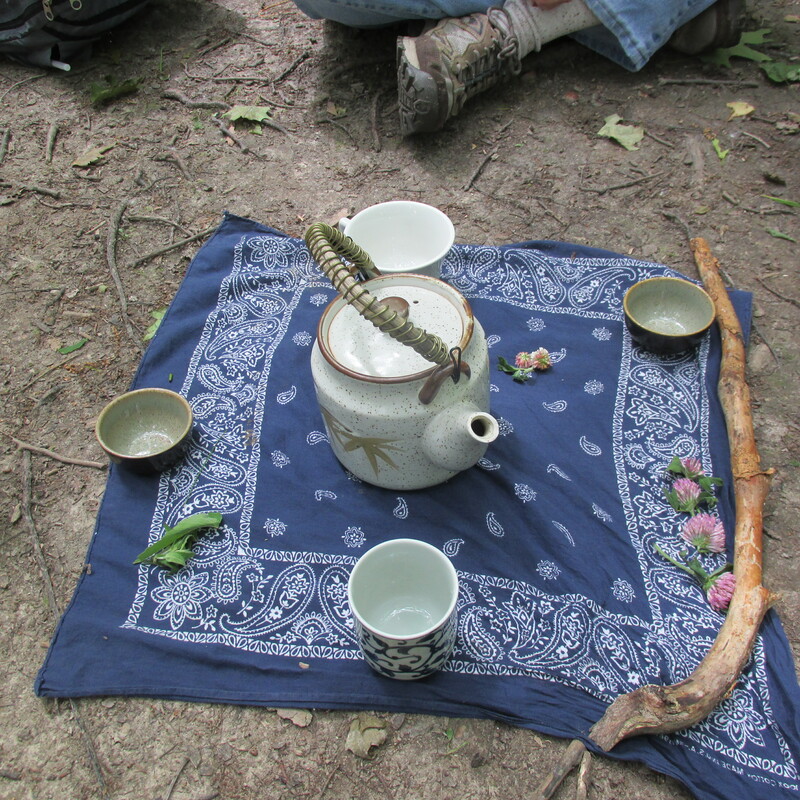 A few wild bergamot leaves, some red clover heads for a sweetener, and presto — delicious foraged tea! One misconception I had when first was introduced to wild bergamot was that it was an ingredient in Earl Grey tea. After all, the plant smells like Earl Grey tea, doesn’t it? Further confusion: If you look at the label of Earl Grey or Lady Grey tea you’ll see bergamot listed as an ingredient. But in this case, bergamot refers to a citrus fruit, the bergamot orange (Citrus bergamia), not our familiar prairie plant. Earl Grey tea contains some of the essence of the bergamot orange’s peel. 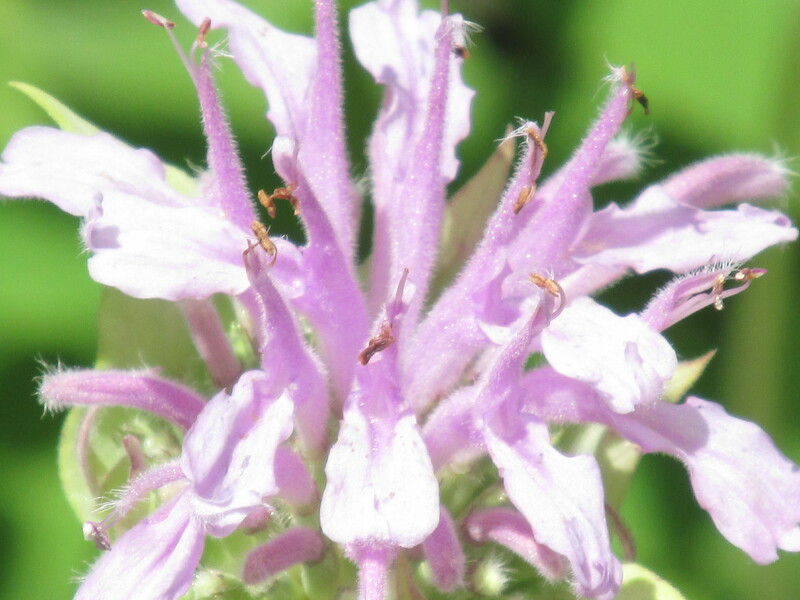 Our native flower shares that same citrusy-minty fragrance and so is believed to take its common name, wild bergamot, from the orange. You’ll find lots of different bee balms in gardens, including a pink variation, like this unknown species given to me by a generous friend. I grow the native, pink, and scarlet bee balms in my backyard. 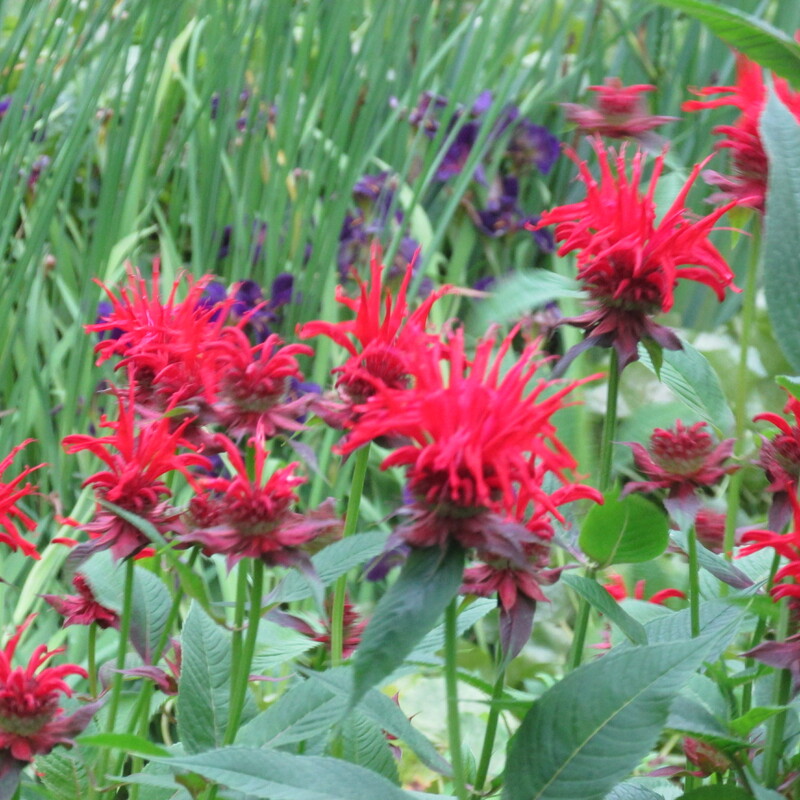 The hummingbirds seem to prefer the scarlet color of Monarda didyma. 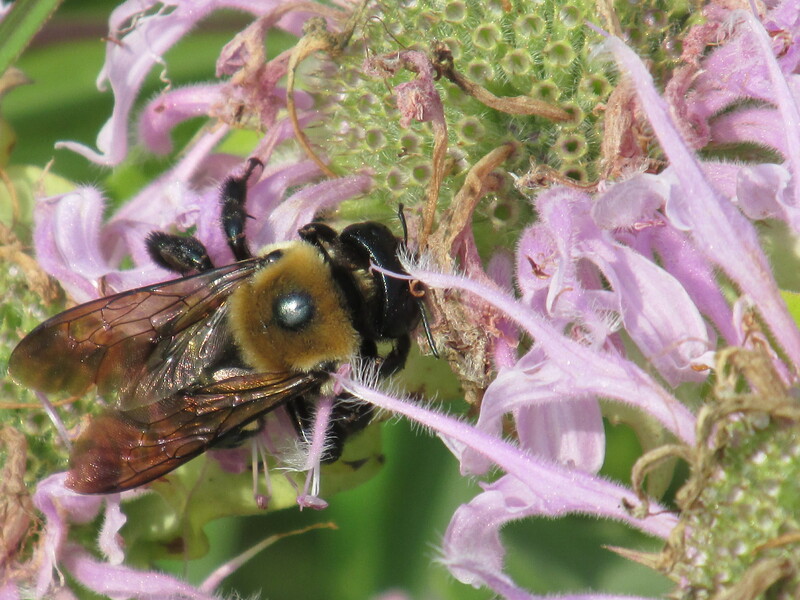 But although scarlet bee balm is native to the Northeastern United States, many naturalists consider it non-native in Illinois and thus, unwelcome on the Illinois tallgrass prairie. 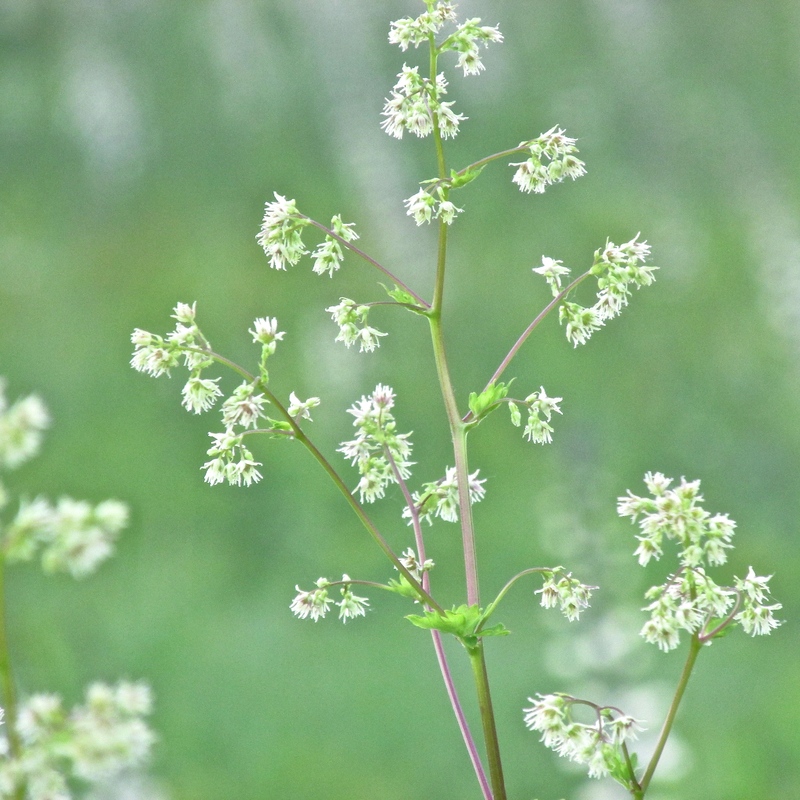 It’s also a rapid spreader, and can become invasive. Oops! Ah, well. It looks pretty in the garden, doesn’t it? A little compromise might be in order. I’ll just keep it out of my prairie patch. All photos by Cindy Crosby: (top to bottom): Wild bergamot, Monarda fistulosa, Nachusa Grasslands, Franklin Grove, IL; bee on wild bergamot, Schulenberg Prairie at The Morton Arboretum, Lisle, IL; wild bergamot and false sunflowers (Heliopsis helianthoide), SP; silver skipper on wild bergamot, NG; wild bergamot, SP; foraged tea party, TMA; wild bergamot, SP; pink bee balm (species unknown), author’s backyard garden, Glen Ellyn, IL; hummingbird feeder and scarlet bee balm (Monarda didyma), GE; scarlet bee balm, GE. 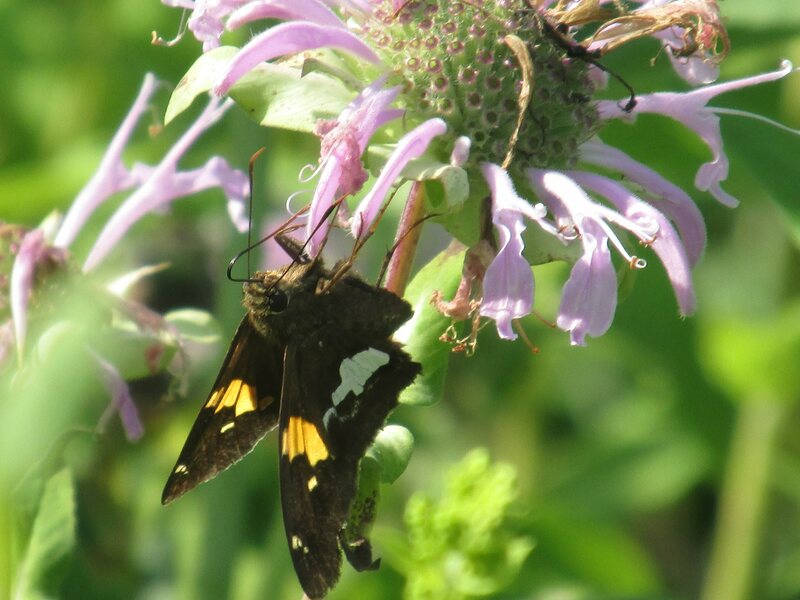 Information on wild bergamot and other bee balms was taken from many sources, including the Ladybird Johnson Wildflower Center: http://www.wildflower.org/plants/result.php?id_plant=MOFI and Illinois Wildflowers: http://www.illinoiswildflowers.info/weeds/; and Native American Ethnobotany by Daniel Moerman. 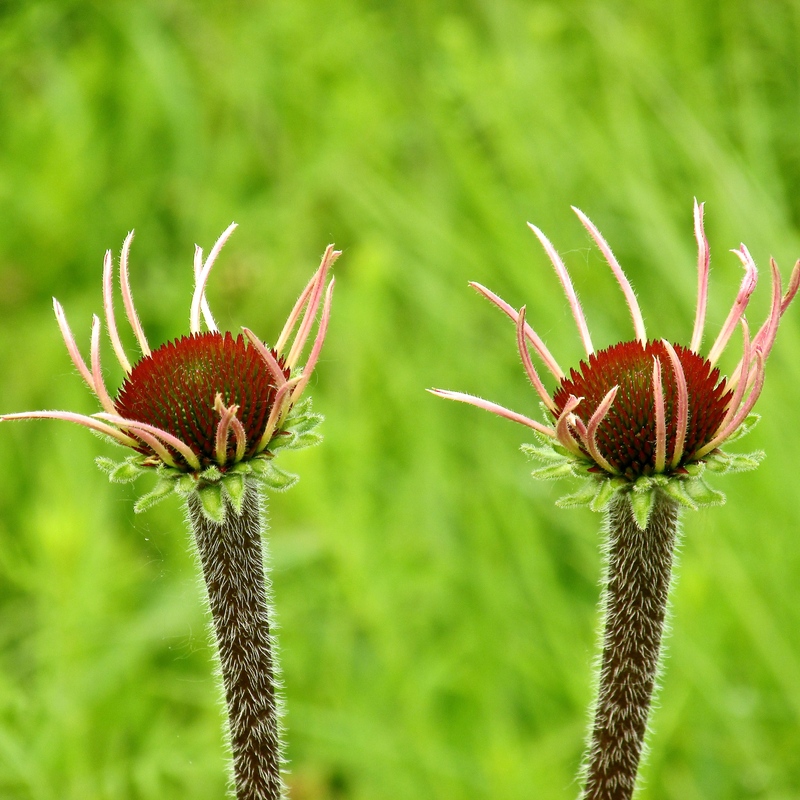 Echinacea – the name almost sounds like a sneeze, doesn’t it? 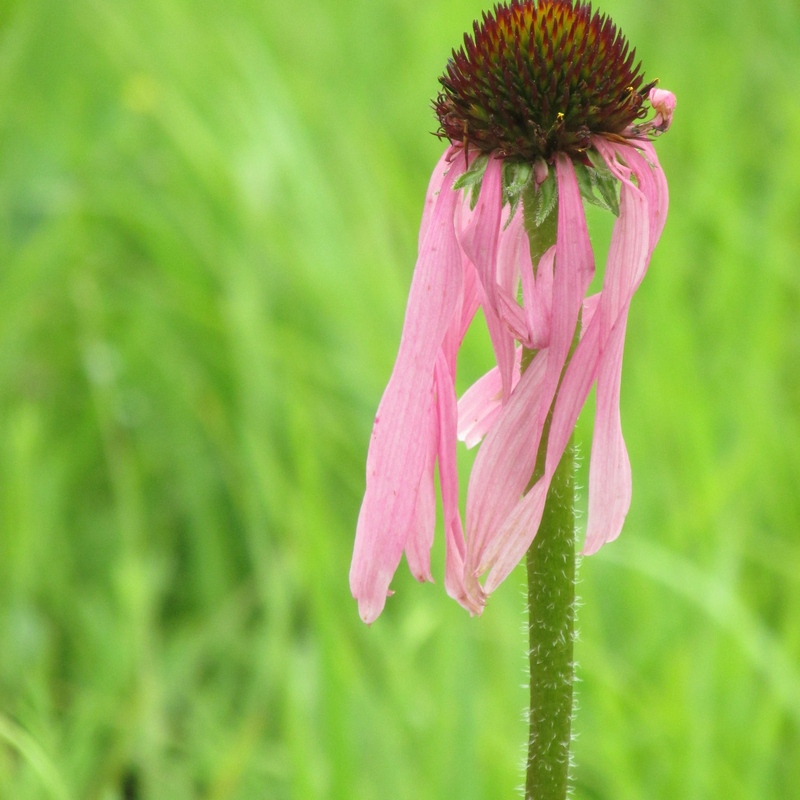 So perhaps it’s not surprising that the pale purple coneflower of the Illinois prairie, Echinacea pallida, is one of the three coneflowers used for medicine. Specifically, for fighting colds. 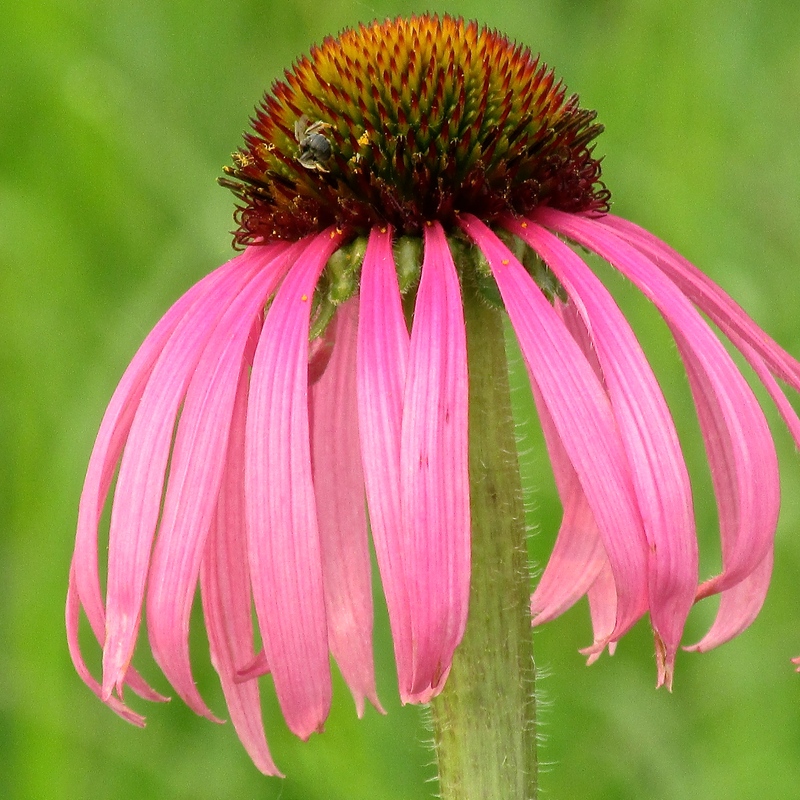 Two other species used medicinally are purple coneflower (Echinacea purpurea) and narrow-leaved purple coneflower or “black Samson” (Echinacea angustifolia). I have the purple coneflower, purpurea, in my backyard garden. Pretty! The goldfinches love the seeds. 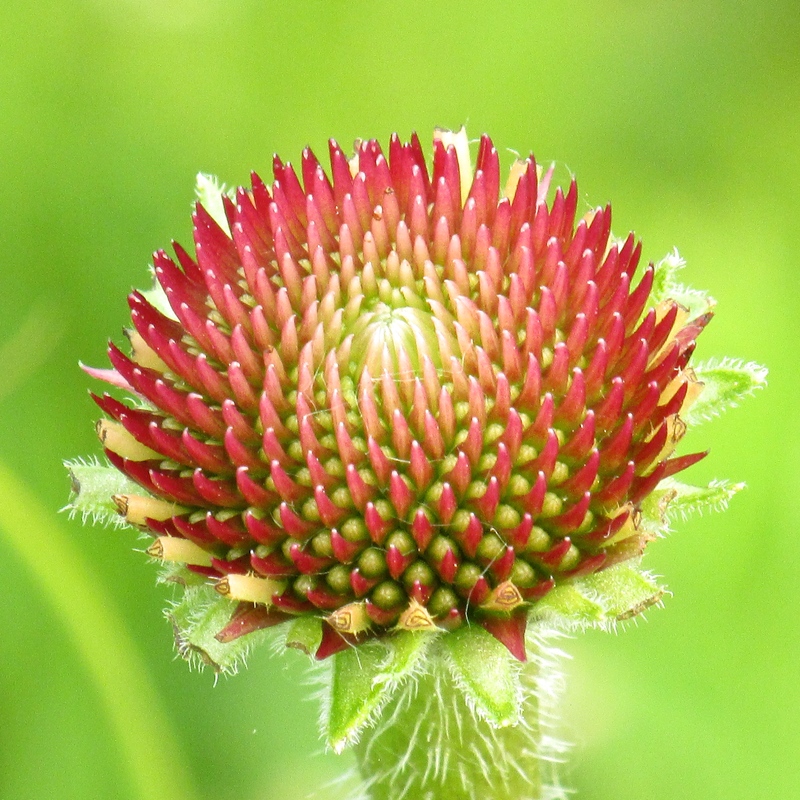 Native Americans smeared the juice of coneflowers on their hands, then plunged their hands painlessly into boiling water or were able to handle hot items without flinching. 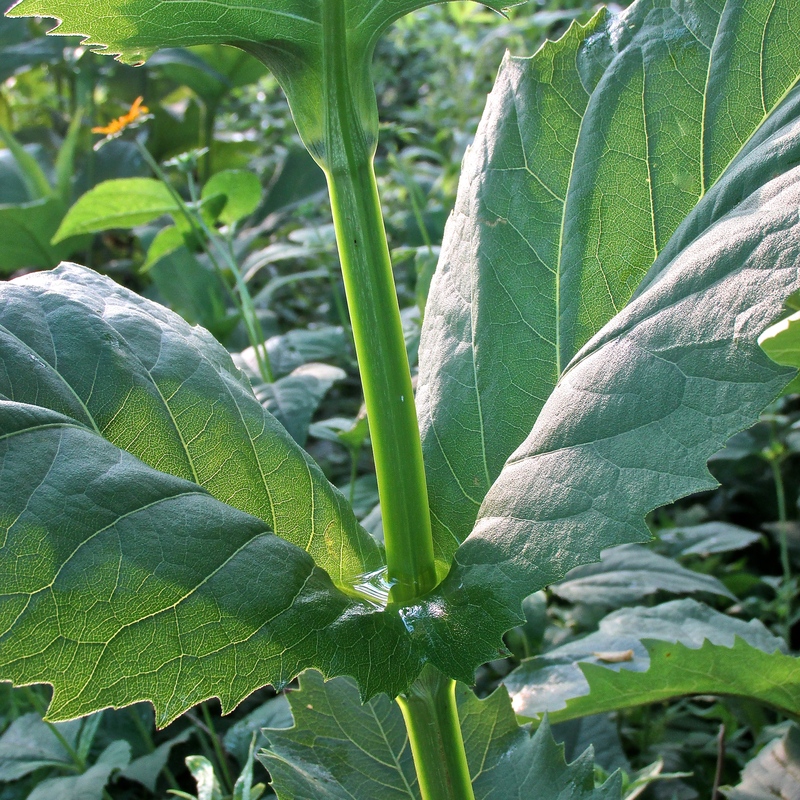 When chewed, the coneflower root helped numb toothache pain. 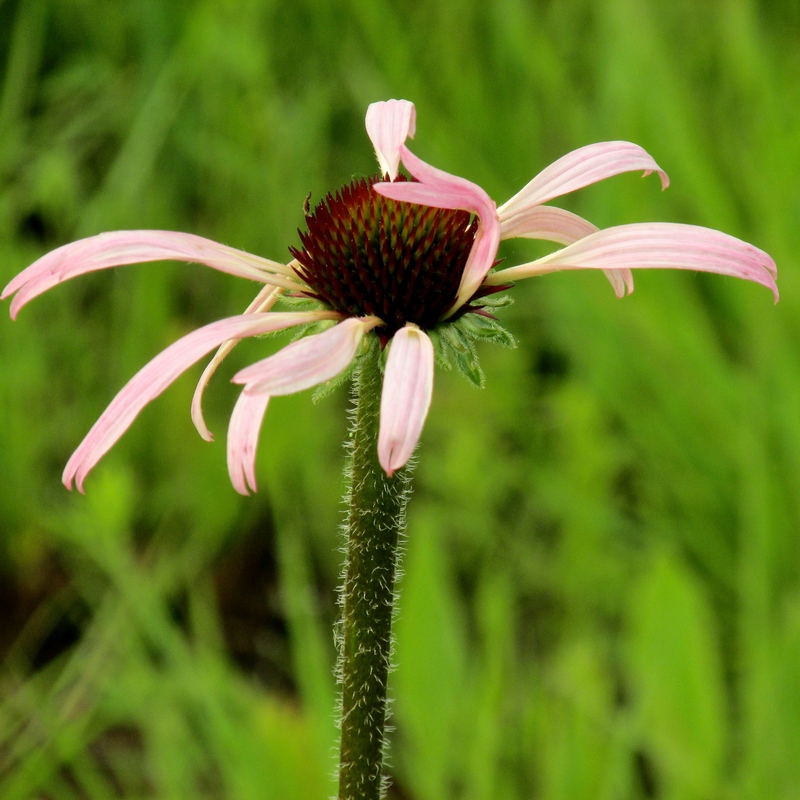 Coneflowers were also made into concoctions used as a remedy for sore throats and as an antidote for snakebite. 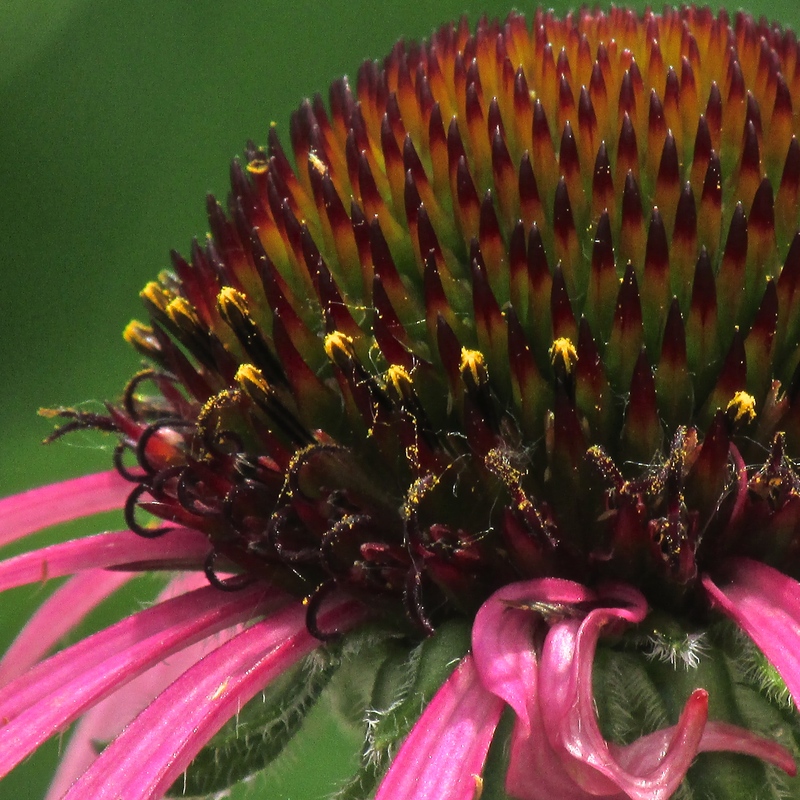 The scientific name for pale purple coneflower comes from the Greek, echinos, meaning “sea urchin” or “hedgehog.” Take a look at the center dome. Yup. Appropriate, isn’t it? 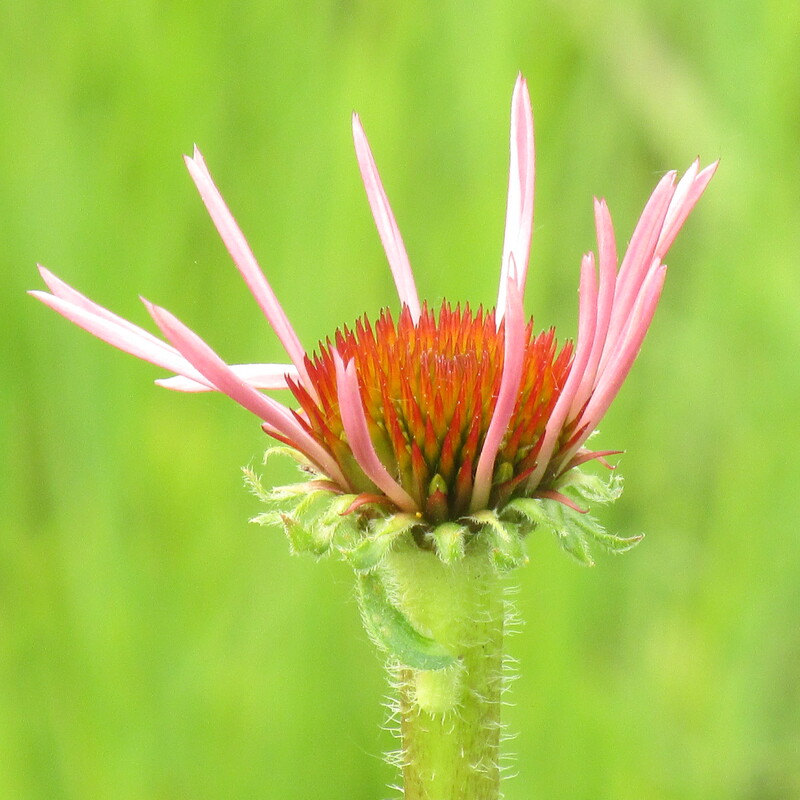 The Mayo Clinic notes that Echinacea sales make up to 10 percent of the dietary supplement market, but offers cautions as to results. There might be better cold remedies than this prairie icon. 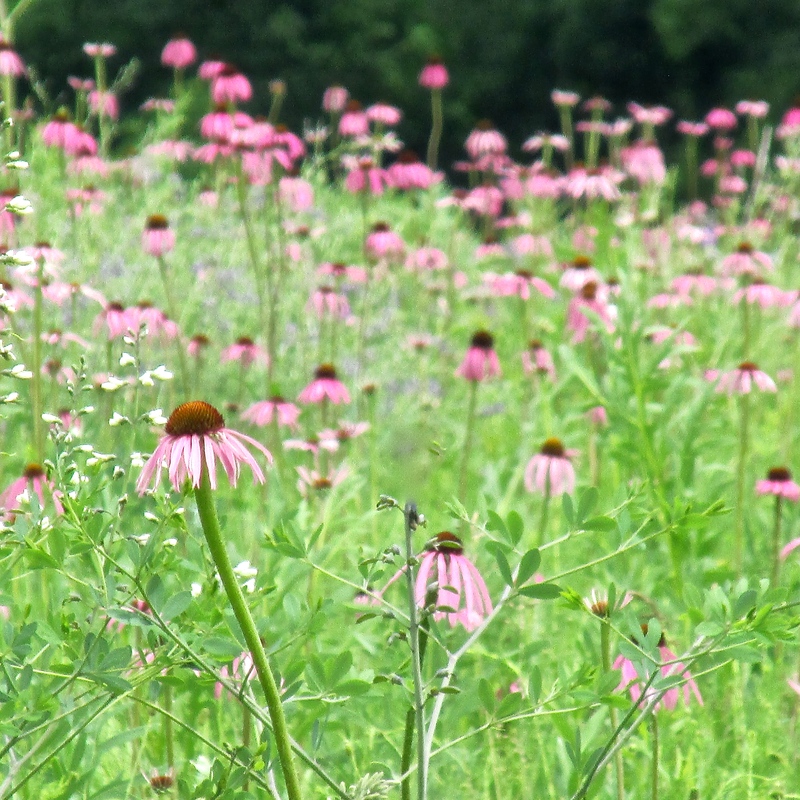 Maybe the best use of the pale purple coneflowers is as eye candy on days when the world seems like it is lacking in beauty. 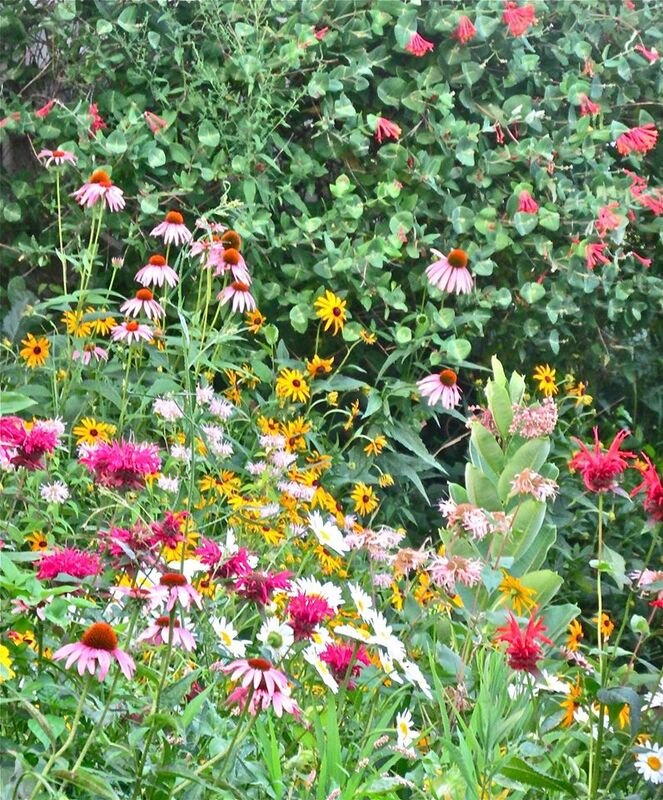 Or perhaps, the coneflower’s best use is as medicine for the soul. Feel your spirits lift just looking at them? Me too. Against a backdrop of white wild indigo and bright blue spiderwort, could anything else be prettier? 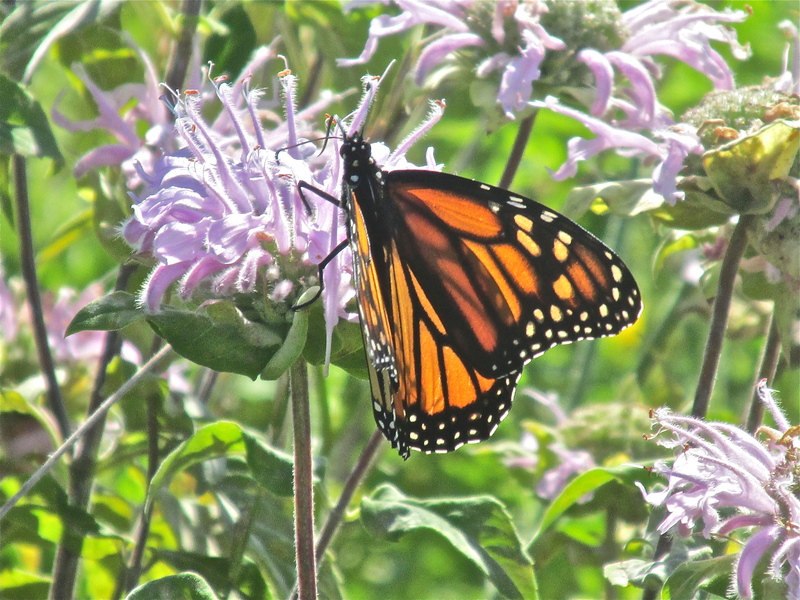 And yet… we could lose them all unless we continue to care for our prairies. us, the most vanishing of all. All photos of pale purple coneflower, Echinacea pallida, Schulenberg Prairie, The Morton Arboretum, Lisle, IL; except garden photo of purple coneflower (Echinacea purpurea) with bee balm (Monarda didyma, black-eyed Susans (Rudbeckia hirta), common milkweed (Asclepias syriaca) and gold flame honeysuckle (Lonicera x hecrottii), author’s backyard, Glen Ellyn, IL; bottom landscape photo of Schulenberg Prairie includes pale purple coneflowers, blue spiderwort, Tradescantia ohiensis, and wild white indigo, Baptisia alba. Rilke quote is from 9th Duino Elegy. Mayo Clinic information is found online: http://www.mayoclinic.org/drugs-supplements/echinacea/background/HRB-20059246. 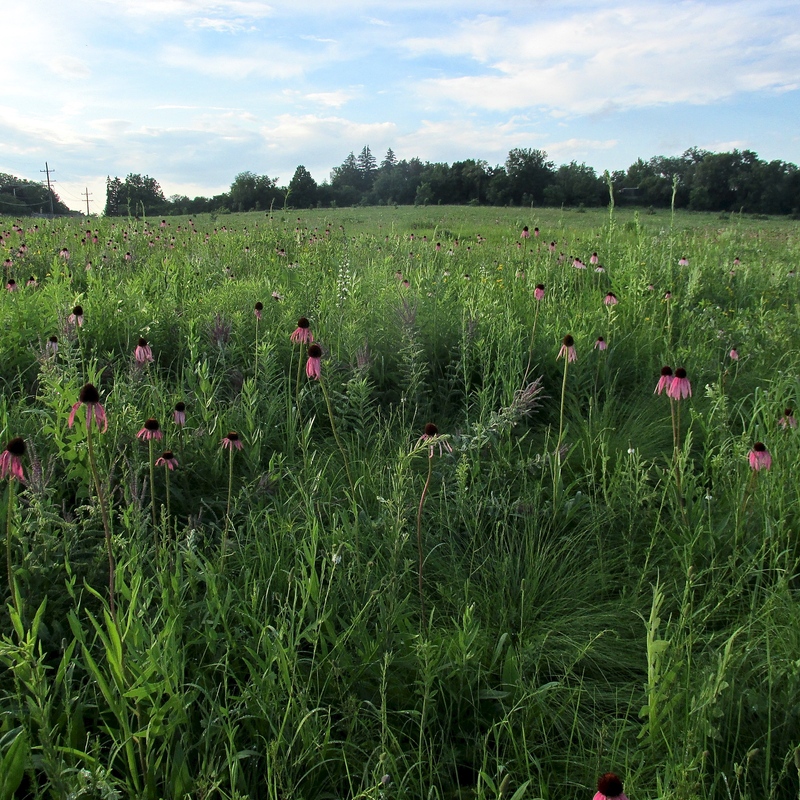 Info on medicinal uses and scientific meaning of the coneflowers is from Wildflowers of the Tallgrass Prairie: The Upper Midwest by Sylvan Runkel and Dean Roosa and Native American Ethnobotany by Daniel Moerman. 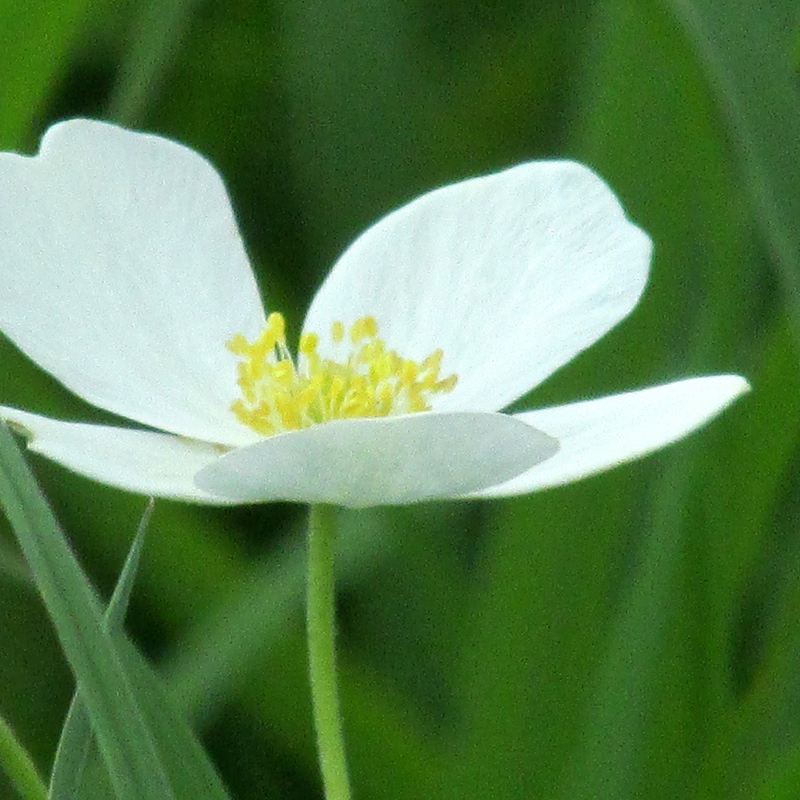 It’s a fleeting pleasure: white flowers on the prairie in early June. 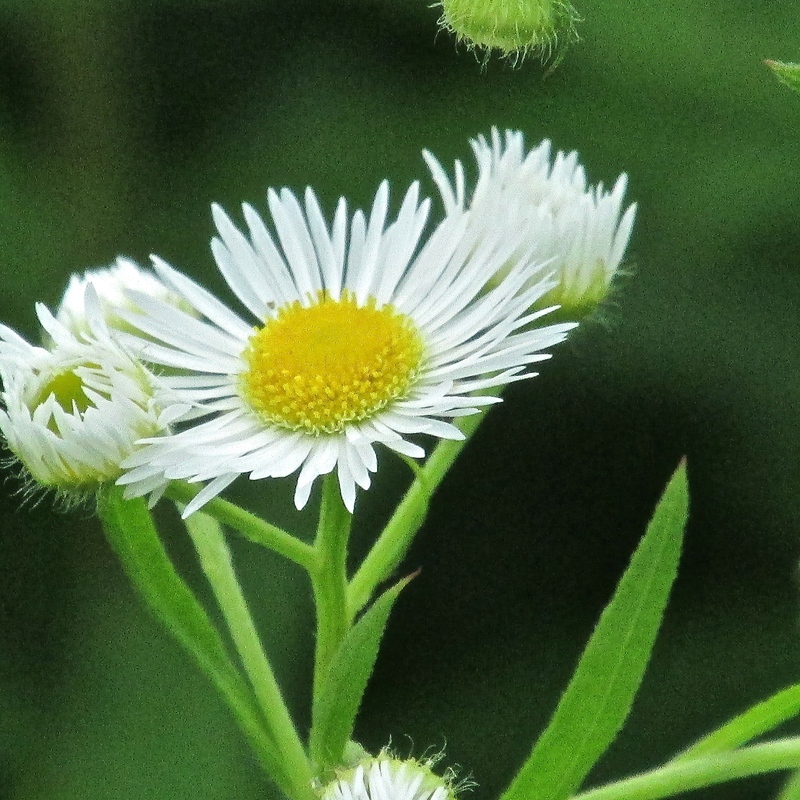 Saucy, fringed daisy fleabane. A little weedy? Yes. But cheerful all the same. 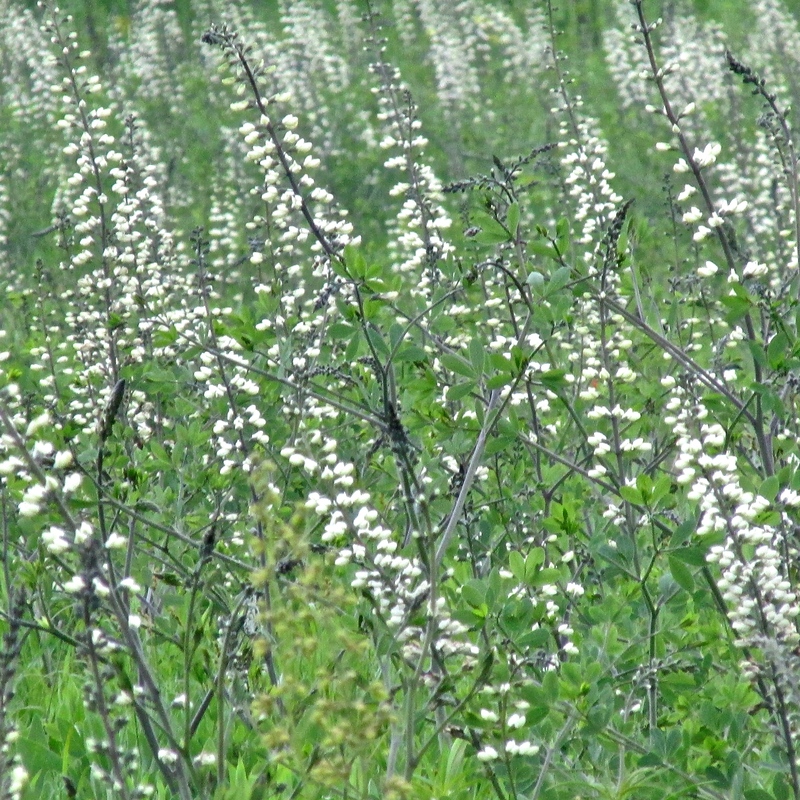 But the real show-stopper on the Illinois prairie this week is white wild indigo. 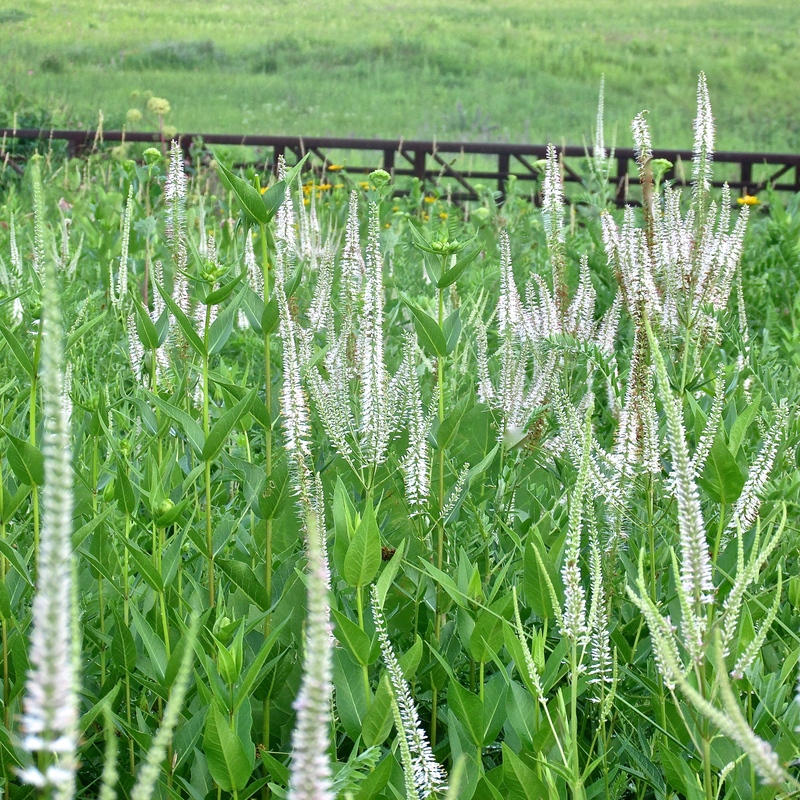 Although its new growth looks like asparagus; ironically, white wild indigo is in the legume family, Fabaceae, sometimes called the pea or bean family. Asparagus and bean allusions not withstanding, early settlers were wary of the indigo, as its foliage is toxic enough to kill grazing horses and cattle. 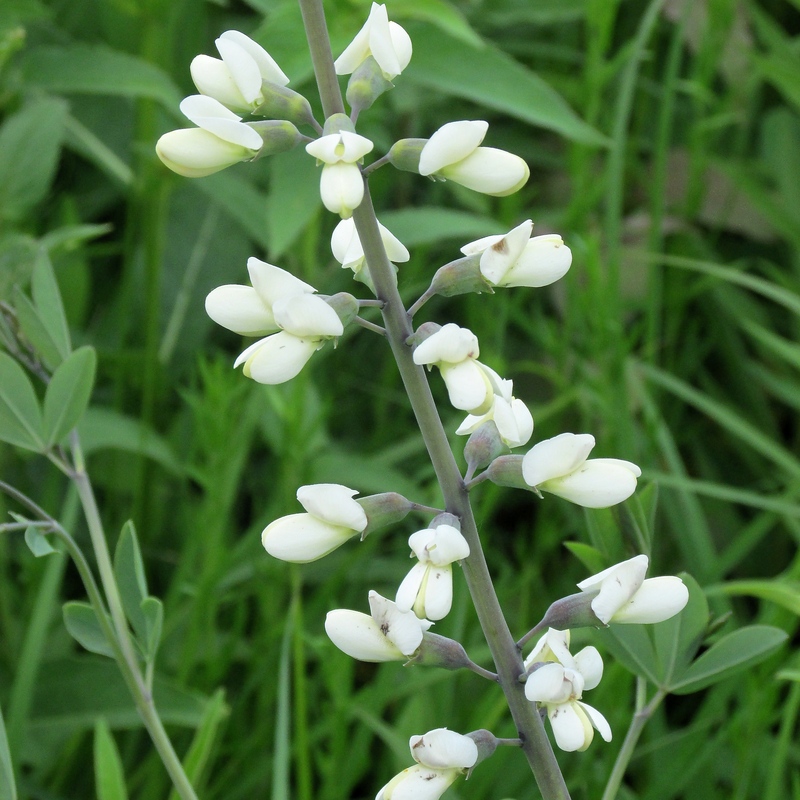 White wild indigo’s scientific name is Baptisia leucantha or Baptisia alba. Baptisia’s name comes from the Greek, bapto, “to dye.” But the source of the dye that colors your blue jeans once came mainly from tropical plants in the genus Indigofera, although other species of Baptisia were also once used to dye textiles. Today, indigo dye is almost always made synthetically. 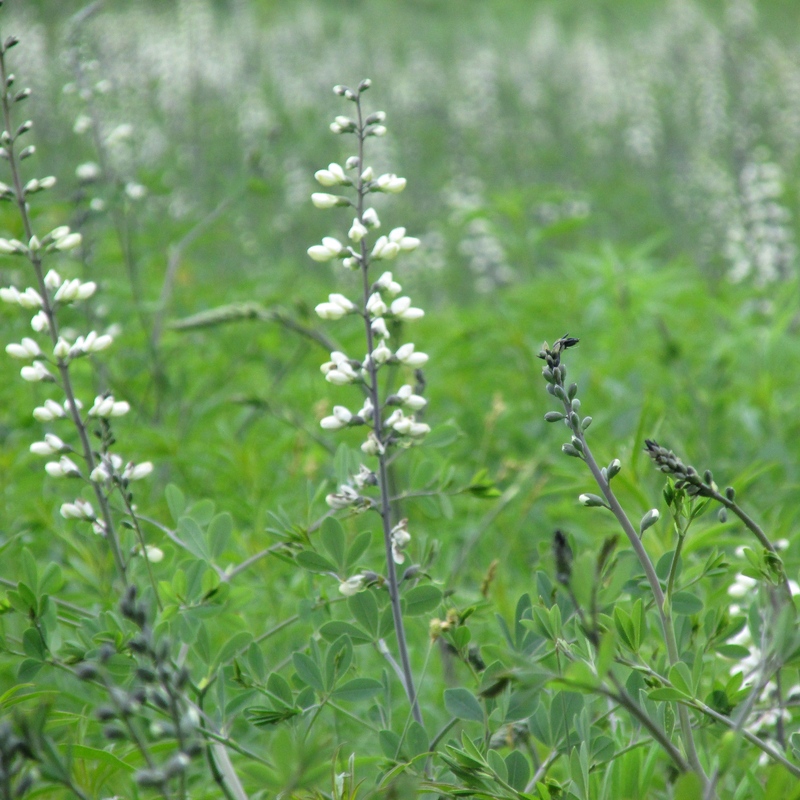 White wild indigo is also known as false white indigo. 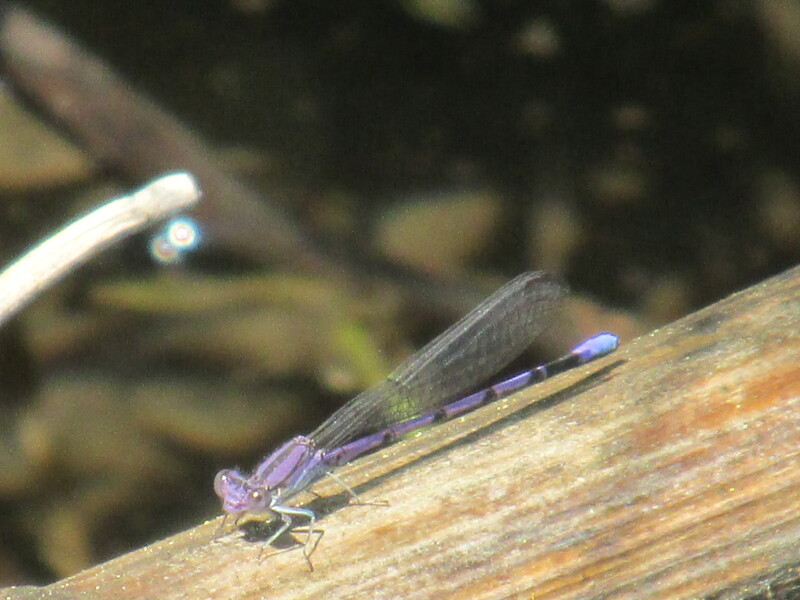 The word “false” indicates that it is not the “true” indigo of the tropics. False it may be. But it is truly this week’s extravagant offering of the Illinois tallgrass prairie. 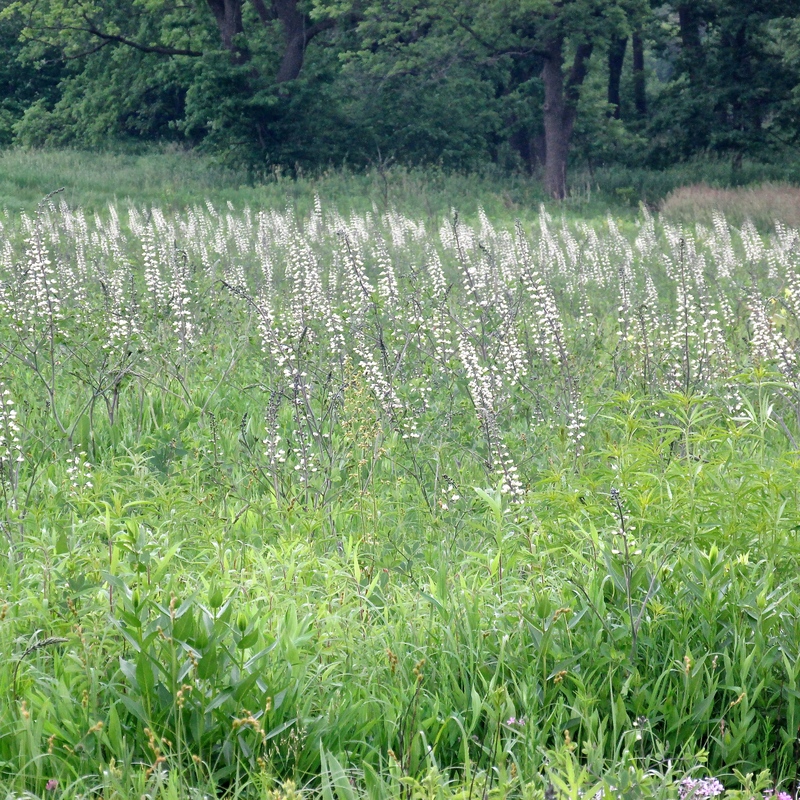 Next week, the spikes of white may be gone, their blooms finished for another season. Why not see them while you can? All photos by Cindy Crosby from the Schulenberg Prairie, The Morton Arboretum, Lisle, IL: (from top to bottom) Daisy fleabane (Erigeron strigosus); purple meadow rue (Thalictrum dasycarpum) ; northern bedstraw, Galium boreale; meadow anemone, Anemone canadensis; white wild indigo (Baptisia leucantha or Baptisia alba macrophyllaor even Baptisia lacteal);white wild indigo; edge of Schulenberg Prairie and savanna; white wild indigo. the streams, the creeks that edge the tallgrass. Which split open and become something new. Turn their gaze on you. 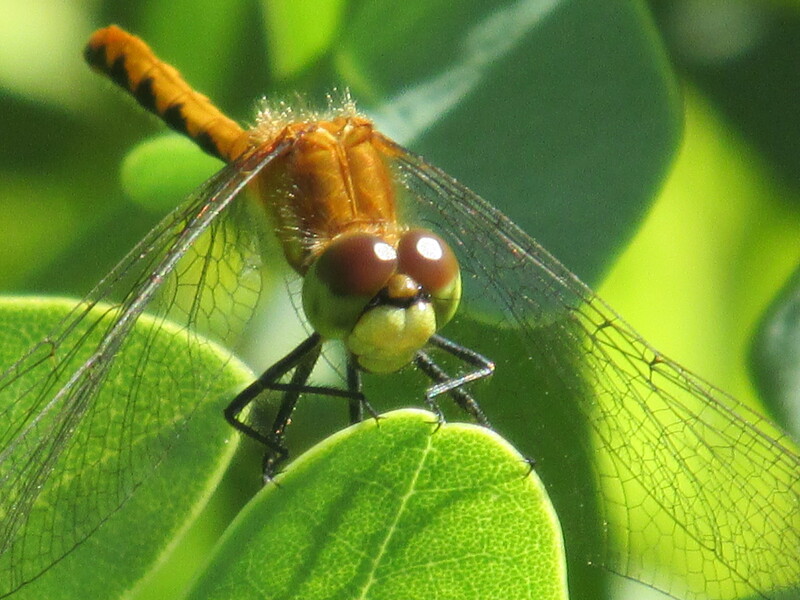 Note on Dragonflies and Damselflies. 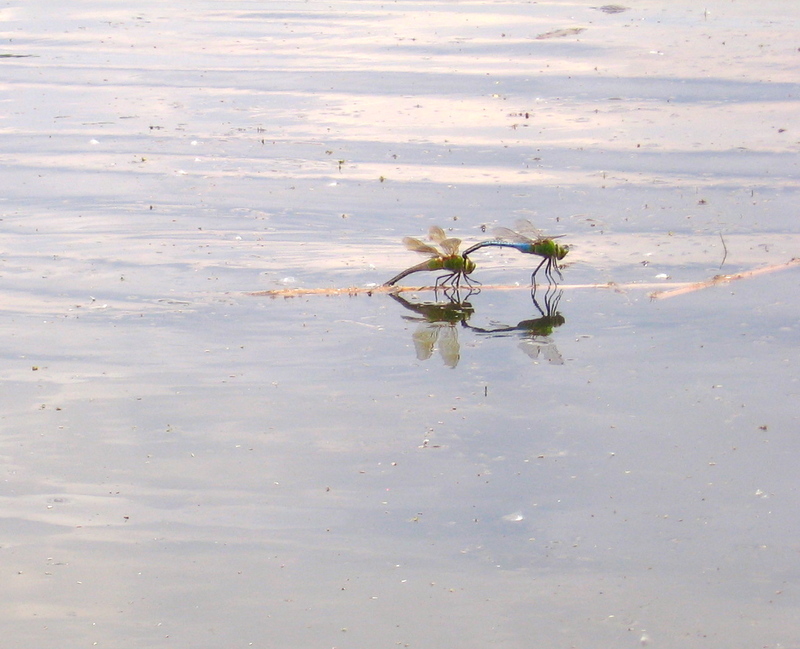 They begin life as eggs, which are laid in the water. 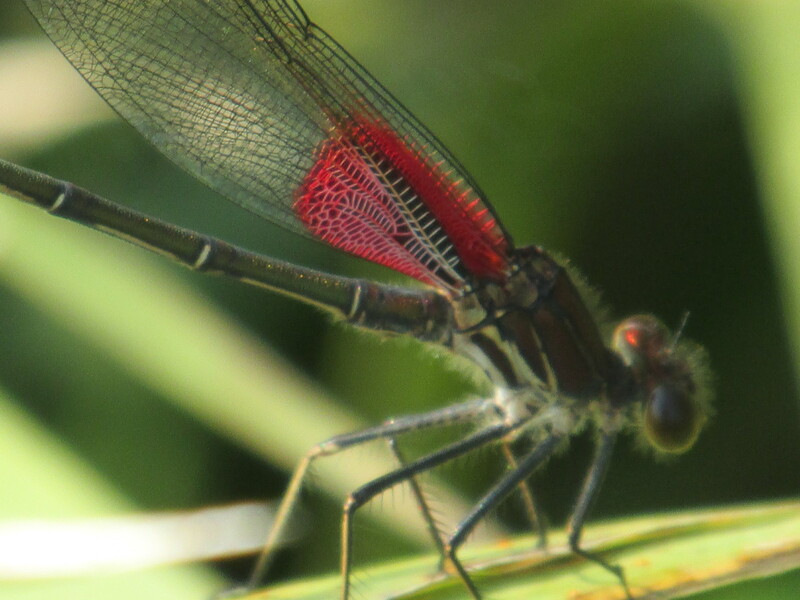 Then, they hatch into ugly, drab, beetle-looking nymphs; dragonflies and damselflies live in this stage for as long as eight years in ponds, streams and other wetlands. 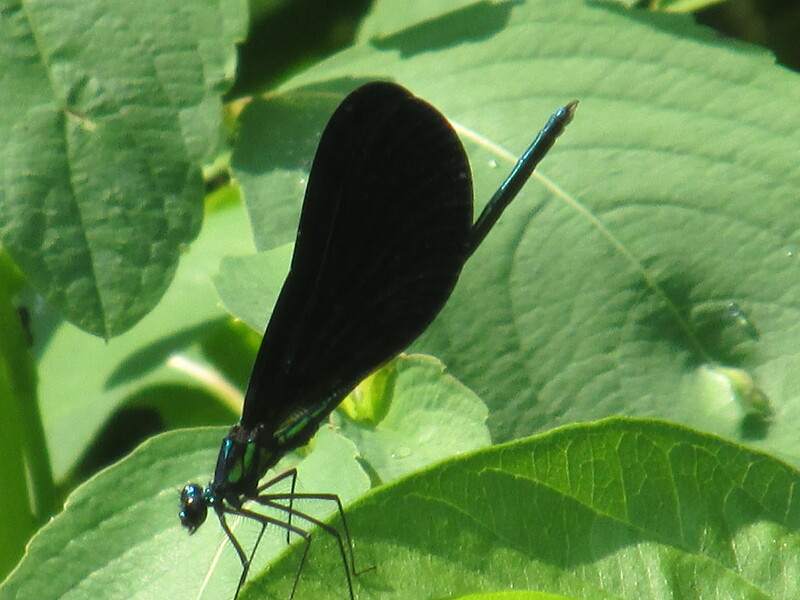 Responding to many different signals we don’t fully understand, they pull themselves out of the water and their bodies turn from drab and unattractive into the beautiful flyers we know. This process is called incomplete metamorphosis. 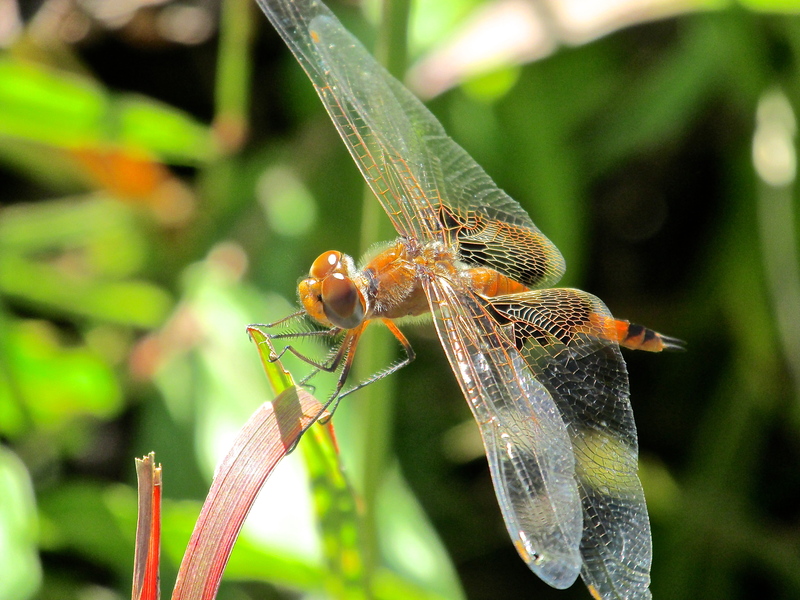 As adult dragonflies and damselflies, they may live for as little as a few minutes if snatched by a passing bird, or as long as several months here in Illinois.